Fact! On average, you spend more than $5,000 per liter on ink and toner cartridges. That’s more than a vintage bottle of champagne or expensive perfume; and you thought gas prices are bad? It’s no secret that ink and toner cartridges cost a lot more than their compliment. It’s called the “loss leader model,” and this is how companies profit. Cheaper the printer, the more expensive the cartridge. Purchasing re-manufactured printer cartridges is considered the best way to save without reducing your print load. But why are so many consumers feeling reluctant to purchase a recycled product? The answer to this question is tied to customers not knowing or understanding the process. Let’s review how recycled cartridges are processed and crush your inhibitions. There are minor differences in how ink and toner are re-assembled for use. However, the steps below will give you a clear understand of this diligent process. Raw materials, such as the electrical circuits for the ink and the drums for the toner, are inspected to verify their quality. All the components are cleaned and prepared to be filled with new ink or toner. This kicks-off of the actual recycling process. The cartridges go through sorting and grading and only the premium cartridges are used to guarantee optimal performance. Components are then disassembled and recycled. The disassembled toner cartridges are cleaned through an automated machine that splits the toner hopper which is where the toner is stored. The cartridges are then filled with new ink or toner by an automated filling machine and then sealed to prevent any leakage. Each cartridge is tested by highly trained quality control professional to ensure that they perform well. Each toner hopper is filled with new toner by an automated machine that precisely weighs the amount of ink or toner within the cartridge. There’s usually more than one test before any shipment leaves the facility. The cartridges are now packaged and cleaned while the hopper is also cleaned and sealed by an automated machine. 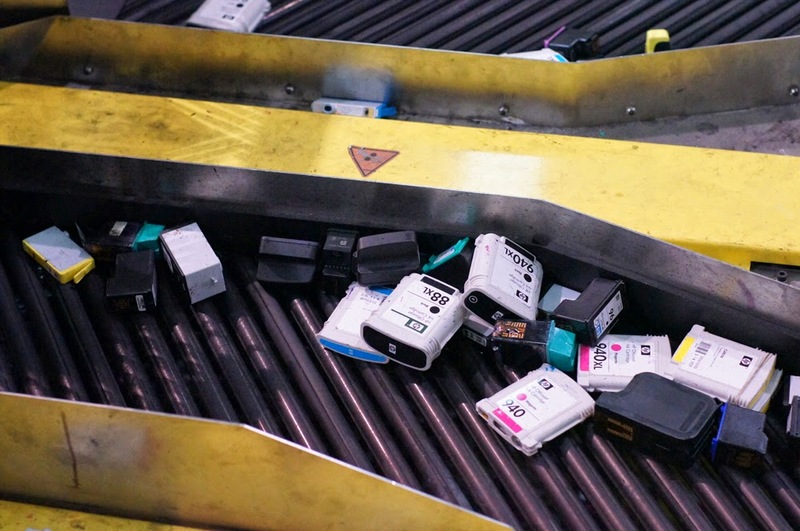 With the guidance of industry standards, each ink and toner cartridge is tested again to guarantee performance and all other components are now re-assembled with more than 70% of the components being new materials. Quality Control experts perform routine inspection before the re-manufactured ink and toner is made available to the public for consumer use. Companies, such as Compandsave.com, implement this very same process in re-manufacturing their cartridges. In following this method, they emphasize on the notion that the compatible brand is just as good as the genuine brand. The only remaining difference is the cost. To save up to 80% on Inkjet and Laserjet cartridges, subscribe to our email list and like us on Facebook to receive special discount offers.